1. This image was created with Emily in mind. Emily sent me a message last week telling me about a recent experience she had, and the effect it had on her. Emily was once told by a friend that she was a keeper of lost souls – she consistently reaches out to people who need help and does whatever she can. Confronted by a situation where a friend was in need and there was absolutely nothing she could do, she found herself lost, disconnected from that part of her identity. She told me that she really wanted to make a piece of art about that specific situation. I was immediately really excited about it because I had recently been thinking about making art that’s tailored for other people, about their life, their experiences. I asked her if she’d let me do this for her and luckily for me she was on board! The idea itself was one that I had had a little flash of in my mind before, but hadn’t fleshed out, and fit her story so well that I decided to propose that idea to her. We fleshed out the idea, gave it a story and a title, and decided to shoot this past Sunday. The title of the photograph is called The Keeper. 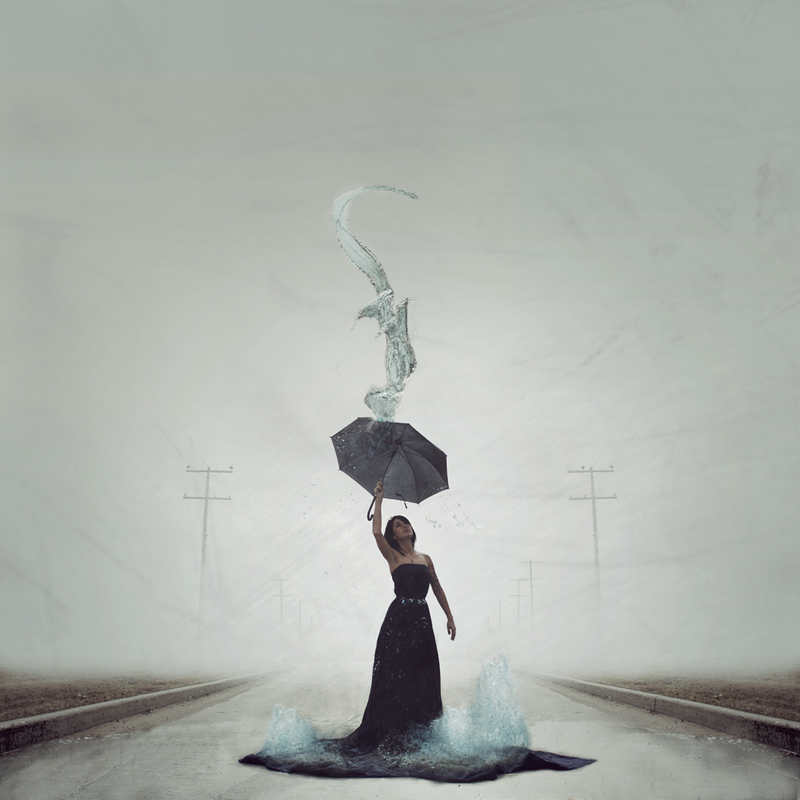 A young woman tries to catch the rain that’s falling upward, but finds that she can’t catch all the pieces and even if she could, there was too much for her to hold. (Big thank you to Martin and John for coming along to help! We couldn’t have done it without you!). I’m available for commission on these types of tailored fine art portraiture! But it’s really important that if you want one of these done that you’re really in touch with what it is that you want to express – whether it’s a detail about yourself, your character, something about your life that really affected you, or made you question yourself, or overcame. The stories that helped shape who you are. 2. The second reason why I’m really excited about this photograph is that it’s the first in a new series that talks about mastering your craft using what you have. The best camera to use is always the one that’s in your hands and you shouldn’t let your gear limit your growth. So often I find people blaming their gear for why they aren’t happy with their work, or wanting an upgrade without really knowing why. DSLR’s are amazing tools and are all capable of creating amazing art, but it requires taking the time to master the craft – not only to improve upon yourself as an artist, but to understand the tools you have, their limitations, and how to work within them. It requires creativity and innovation, something that everyone is capable of. I hope that this series can help inspire, encourage, and challenge other people to be the best they can be, and remind all of us that art is about constant growth. There’s always a better you that you can be (and that makes for a pretty amazing journey). I’m going to be shooting mostly on my old Canon Rebel XS (new in 2010 – many newer models since then!) and the 18-55mm f/5.6 kit lens, although I’m hoping to get my hands on some sort of compact camera to play around with too. It’s going to be so much fun! I’d love for anyone reading this to share with me the art they’re working right now, and why you’re excited about it. There’s nothing that feels better than sharing our passions with each other, it would be great to hear what you’re doing! How do you keep yourself inspired and motivated? What do you hope to achieve with your art in the next year? As a final word, I have another speed edit for you, and Emily sings! I was going to do a video blog, but I totally chickened out. Maybe one day I’ll be able to get an entire shoot filmed! Pssssst. This photo is available as a print! So thankful we got to do this together! ❤ And your edits are spectacular! YOU are spectacular! ❤ We make a killer team! Lovely work, Jen and Emily. Awesome! Hope it’s okay that I am using this as my computer wallpaper right now. Good work! This one! I love it. Its just plain beautiful. So much raw emotion and creativity it makes my imagination go wild! Youve truely outdone yourself. And with the good old rebel as well. Congrats again. Love the work. I personally would love hanging this on my wall! The newest photo (the one in the barren landscape with the latern) was actually shot just after sundown and I had to pop the ISO up to 400, which is more than I would have liked, but I dealt with it. Once everything comes together, you really can’t tell so much. And that’s slightly to do with the fact that I add texture on in post anyway and reduce noise. Noise is probably the best argument for upgrading if you have to shoot in a lot of low light situations and use higher shutter speeds. There’s usually a work around though – instead I could have shot on a cloudy day instead of so late in the day. I would have gotten a similar light distribution (which was my main concern – I want very diffused light in all my photographs) but still had enough light to shoot at ISO 100. Thank you for the follow of my blog. I must say my heart did a huge leap when I saw I had gained a follower who was not a food or fashion blogger (no offense to either), but a real live person who takes photos, but also seems to think along the same lines as I do. Oh man, I understand your feelings so much. I’ve been spending time trying to actively find people who are passionate about the same things I am, and it’s so much harder to find then you’d think. It’s one thing to like the photographs – it’s a whole other thing to engage completely and mutually talk about art and images.